Amazon has ordered “Utopia” straight-to-series. 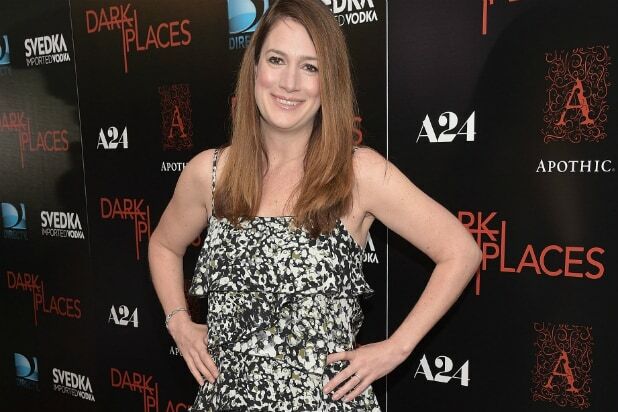 The nine-episode series hails from “Gone Girl” writer Gillian Flynn, and it marks the first project under her new overall deal at the streaming studio. Flynn’s “Utopia” has been the works for quite a while and floated around various platforms. The adaptation of Dennis Kelly’s British series of the same name (not to be confused with the Fox reality show disaster) was originally set for HBO, but that plan died in 2015. This one is a co-production between Endemol Shine North America and Kudos — an Endemol Shine Group UK production studio — and Amazon Studios. “Utopia” follows a group of young adults who meet online and are mercilessly hunted by a shadowy deep state organization after they come in to possession of a near mythical cult underground graphic novel, per Amazon. With it, they discover the conspiracy theories in the comic’s pages may actually be real and are forced in to the dangerous, unique and ironic position of saving the world. Flynn is considered the domestic version’s creator, executive producer and showrunner. Other executive producers include Kelly, Jessica Rhoades, Sharon Hall, Karen Wilson and Diederick Santer. Sharon Levy, president, Unscripted & Scripted Television, Endemol Shine North America, will oversee production for Endemol Shine. The streaming services are taking over the Emmys. Four years after "House of Cards" opened up the major categories to online content providers with three wins, Netflix, Hulu and Amazon have hit an all-time high with a combined total of 126 nominations. But how did we get here? The political thriller became the first streaming-only original series to get nominated in major Emmy categories in 2013. It won three that year, including Outstanding Directing in a Drama Series and Outstanding Casting. The show has been nominated for 53 Emmys in total, six of which turned into major category wins. Netflix seemed to be on a critical roll after "Orange is the New Black" debuted in 2014. It was nominated for 12 awards, including five in acting categories. Uzo Aduba, who plays Suzanne Warren, won for Guest Actress in a Comedy Series. She won a second time in 2015. The Tina Fey-produced comedy was called the "first great sitcom of the streaming era" and the Emmy voters seem to agree. Since premiering in 2015, the show has garnered 16 nominations. "Transparent" was -- and still is -- Amazon Prime's flagship show. In 2015, following its debut season, it won an unprecedented five Emmy awards, including Outstanding Directing in a Comedy Series for Jill Soloway and Outstanding Lead Actor in a Comedy for Jeffrey Tambor. The show has been a continuous staple at the Emmys since. 2015 was a big year for streaming services at the Emmys. "Grace and Frankie" was yet another Netflix series that earned nominations in major categories. The show has continued to be a consistent presence at the awards ever since -- specifically in acting categories. The Marvel Netflix show became the first of the Defenders universe to get an Emmy win, for Outstanding Original Main Title Theme Music. The big addition at the 2016 Emmys was the Aziz Ansari-led comedy "Master of None." The Netflix series earned Ansari nominations for acting, writing and directing -- and a win for writing with his colleague Alan Yang. He'll get another shot in 2017 with more nominations in the same categories, including Outstanding Comedy Series. 2017 is a huge year for Netflix, with 91 nominations for the streaming giant overall. 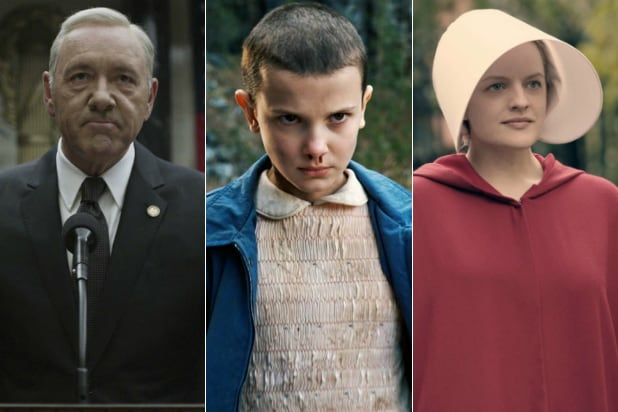 And sleeper hit "Stranger Things,"created by relative newcomers Matt and Ross Duffer, earned a staggering 18 of them, including Outstanding Drama Series. For a genre show released with little marketing, this is quite a feat. The hugely popular (and acclaimed) period drama about the life of Queen Elizabeth II earned Netflix five Emmy nominations this year. In 2017, Hulu established itself as a serious original programming contender with this adaptation of Margaret Atwood's seminal novel. The highly acclaimed series not only became arguably the defining political commentary of the early Trump-Era, it also went on to make history for Hulu with 13 nominations. "The Beatles: Eight Days a Week"
Hulu didn't stop with "The Handmaid's Tale." This documentary about the Beatles earned five nominations. The anthology series didn't qualify for the main Emmys until the third season arrived on Netflix. It got three nominations in 2017, including two for the episode "San Junipero" -- which was nominated for Outstanding Television Movie, despite being a part of an anthology.